THE LAW SOCIETY OF IRELAND stands on what was once a Norse settlement known as Oxmanstown Green. The school was originally called the Hospital and Free School of King Charles II was more commonly known as the “Kings Hospital” or “Blue Coat School” because of the boys’ military style uniforms. Construction began in 1773 and was completed in 1783 following a competition for the new design, which was won by Cork born architect, Thomas Ivory – a major breakthrough for Irish architects who had been long over-shadowed by their English counterparts. Copies of the original drawings are on display in Blackhall Place. While the Governor of the school, Sir Thomas Blackhall, (Lord Mayor of Dublin 1769-1770) had ambitious plans for the building, it was never finished to Ivory’s original design. At the time, the government refused to give public money to the project. Charitable donations were less forthcoming than hoped as the Rotunda Lying-In Hospital was in competition and considered a more worthy cause. Building was finished in 1783 with the main tower left unfinished and much of the plan not implemented. In 1894 the uncompleted tower was removed and the present copula was erected. The Kings Hospital School moved to new premises in Palmerstown in 1968 and the Law Society of Ireland purchased the vacated building. It took 10 years of painstaking restoration before the Society could officially open it as their headquarters on 14 June 1978. The style is Palladian and it is one of the finest examples of such architecture. It is written of the Society’s restoration and conservation work that ‘no Dublin building has been more successfully adapted to new use with more exemplary concern for its character’. The Boardroom, now the Council Chamber, with its decorated ceiling and the two fine corridors, known as ‘Italian’ corridors are most notable examples of Ivory’s design. The Chapel, known as the ‘President’s Hall’ with its fine plasterwork of the Georgian period was enhanced in the 1950’s by the installation of the stained glass east window, designed by the renowned Irish artist, Evie Hone. The building presents the same facade as it did 200 years ago, with its shallow curves and slender lanterns and lace like balustrades. 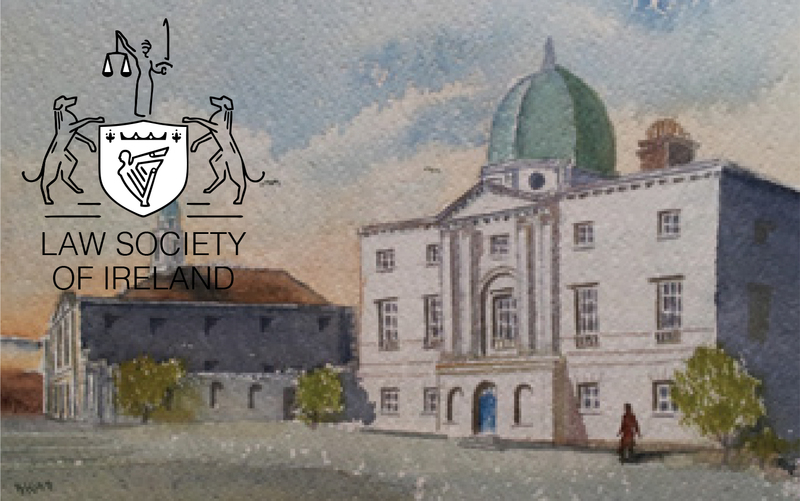 It is now the headquarters of the Law Society of Ireland – the professional body responsible for the regulation, education and representation of solicitors.